Got a brand-new HTC phone and wanted to sync all contacts from your old Nokia phone to the new HTC phone? Actually, it is just something necessary that you need to do whenever you get a new mobile phone. Speaking of syncing contacts between two different mobile phones, you may consider typing these contacts information on your new device one by one! But if you have hundreds of contacts saved in your old Nokia phone, it may takes you a whole day to finish the task. Don't you want to try an easier way? 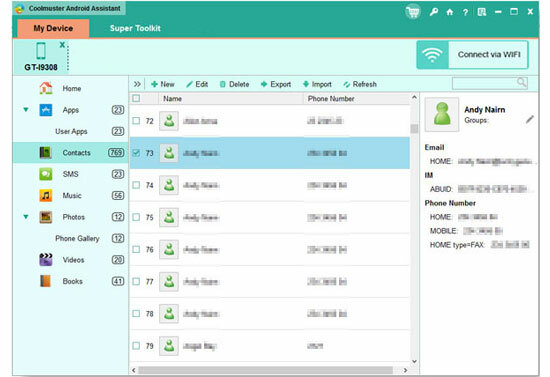 Here, you can rely on this Coolmuster Android Assistant, which is a professional and powerful software to help users freely share any files between two different phones. With this software, you can transfer batches of contacts from Nokia to HTC phone without any restrictions. Aside from contacts, this software can be compatible with other types of files like messages, music, videos, and etc. Also, this software can support all types of Android devices including mobile phones and tablets. You can fully trust in this powerful and secure software to be your best Android assistant! Now, you can click on the below icon to get the right free trial version of this software! After opening the installed software on the computer, connect your Nokia phone to the computer via the USB cord. Then this software will detect your Nokia phone and show the below interface. As you can see, all file folders are arranged on the left panel. You can enter the Contacts folder to choose the files you want to transfer from Nokia to computer and then click on the Export option to transfer the contacts from Nokia to computer in one click. You are suggested to specify a folder to save the exported files. Now, get your HTC phone connected to the computer. And then this software will detect your new HTC phone and show the same interface as pictured in the above. Finally, click on the option of Restore to transfer the backed up contacts to your new HTC phone in one click!